This past weekend on impulse I bought a Christmas tree. I thought I might skip it this year, but as I wheeled my cart of groceries home I remembered the German couple down the block who alway sell crisp Noble firs from their driveway. If the couple isn’t home, you take the tree you want and slip your money through their mail slot. I chose a small, sparsely limbed fir (why do people always call them “Charlie Brown” trees? I prefer to think of them as “Napoleons”) and spent the evening decorating it with ornaments while Nat King Cole serenaded from the stereo. I wore Caron Nuit de Noël Extrait, of course. Mousse de saxe is a base Daltroff used in a number of his fragrances, but it commands front and center in Nuit de Noël. Mousse de saxe is difficult to describe. It has an opaque, velvety, almost powdery texture, but it smells a little like leather, oakmoss, crushed green stems, walnut shells, motor oil, and a fennel seed or two. Add some wood and a little brightness up top, and you get Nuit de Noël. Nuit de Noël Extrait stays viscous and nut-brown, glowing slightly from the green veining through it, and changing little through the six hours or so it lasts on my skin. I’ve heard the same complaint about Nuit de Noël I’ve heard about Guerlain Vol de Nuit — that it’s boring. True, Nuit de Noël doesn’t shock or challenge (although it might not be easy to wear if you aren’t used to retro-smelling fragrances). But like Vol de Nuit, it smells “basic” in a natural, almost inevitable way. Despite being basic, it doesn't smell common at all. I have only a few drops of Nuit de Noël Eau de Toilette, and to me it is true to the Extrait, although more rosy and airy than the thick Parfum. My sample is probably five years old. I’d like to believe Nuit de Noël is what the Tabac Blond girl dabs on when she doesn’t need to be fierce. She’s at home alone, warm and happy on the couch with a quilt and a novel. A fire crackles in the fireplace, and something good braises in the oven. Sure, it’s a domestic scene, but she still wears vermillion lipstick. Caron Nuit de Noël is sold in Extrait de Parfum and Eau de Toilette in perfume boutiques, selected department stores and online discounters. 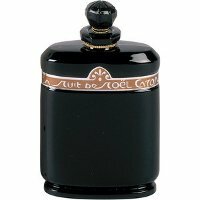 The 28 ml Parfum comes in a killer black flask with a faceted stopper and a gold foil band running around its top with “Nuit de Noël” in a deco font (Nordstrom has it at the moment for $230). Ah, my Precious, my Holy Grail. I may like Party in Manhattan (maybe even Jubilation 25) slightly better in the abstract, but this one I love. It is the perfume my soul responds to. It’s such an easy, comforting fragrance to wear, I think. I really should pull it out more often. Oh, another Party in Manhattan lover! Must try Nuit de Noel – I recollect a blotter smelling very spicy peppery rosy, si I passed, but of course I now feel the urge to test it again!! Loved the review… also took the time to re-read your Nocturnes review. Thank you! I haven’t read that Nocturnes review in years–I hope it still holds up. A nice and very timely review. Thank you, Angela! And it nudged me to dig out my NdN sample and give it another whirl! I’m glad you enjoyed it! Please let me know what you think of Nuit de Noel, too, as you try it. Fab review! I just want to add that Nuit de Noel to my nose is intensely animalic in the dry-down. which I adore. It has that wonderful fur like warmth that helps make it very comforting. The rose/jasmine heart feels very well blended and is married well to the base and top notes. Also, I think that NdN smells very “natural” when compared to other perfumes, although I am sure there are many synthetic ingredients. Although, I love synthetics, I think this natural quality lends to the coziness of this perfume. Thank you for talking about one of my favorites! Thank you for your mini-review! I mostly get ambery wood in the dry down–I wonder if my Nuit de Noel is newer than yours? Once I found an old bottle of Nuit de Noel in an antique store (I still curse that I didn’t buy it), and it had a deliriously gorgeous but strange sludge left in the bottom. In my original reply, I started to put that my nose is practically glued to my wrist for the entire dry-down, which I also adore! In addition to the furry warmth, I get a fair amount of inkiness and also some sandalwood. Mine is etxrait, probably about 10 years old. I have a wee bottle from the 40s, and it’s not appreciably different. Your comment makes me realize Nuit de Noel would make a good candle. I’d love relaxing in a room that smelled like it! Oh, Angela! Thank you for this wonderful review! I just realised that I never tried any of the Carons. Nuit de Noel might be a good start if you say that it’s reminiscent to Vol de Nuit. It doesn’t smell much like Vol de Nuit, but it shares VdN’s way of being–for lack of a better way to say it–rich and lovely and olfactory wallpaper. Nevertheless, it’s good to get to know a few Carons! since I already adore Cuir de Russie… how could i miss? I would advise against buying it unsniffed, at least the current version. I adore Cuir de Russie but modern Tabac Blond left me completely cold. I had a couple of drops of vintage extrait and that was much nicer, imo, although I never fell in love with it. You see there are so very few perfumes that really made me awe – VdN and CdR are amoung them – that I’m very eager to find one more. And TB sounds perfect on paper. But you are right! I have to compose myself and wait til I’m in TSUM where I can try it. Thanks! I’ve heard the new Tabac Blond has lost its teeth–too bad. I sure love the older stuff, though. Yup, from what I remember, Tabac Blond that I tried a few years ago was a sweet, dusty scent, vaguely hinting at some leaf tobacco. Thin and lifeless and definitely lacking that animalic, leathery bite (castoreum?) that my tiny sample of vintage had. Shame. Tabac Blond is one of my favorites, but it’s more of an oily leather than an aldehydic iris leather, like Cuir de Russie. Definitely worth trying! Great review. I love your description of mousse de saxe. I would have never thought of walnut shells and motor oil! But I swear you can really smell them! It’s not a very romantic description, I realize. Unless you’re a mechanic, I guess. Or like to break open black walnuts by driving over them? Or are a crow and throw them on the ground! My grandfather always shelled his black walnuts by piling them on his concrete driveway and driving his farm truck over them a couple of times. Anyone who’s tried to open a handful of black walnuts wouldn’t blame him! I think I’d be afraid of walnut-bullets shooting out at passers-by! I thought everyone used those hand openers to open walnuts! Of course, I don’t know anything about black walnuts. But driving a truck over them? Wow! The shells of black walnuts are EXTREMELY hard. It’s even tough to get them open with a hammer. Your description reminded me of reading a J. Peterman catalog (and I mean that in the best of ways). Very enjoyable and scene-setting. You’ve really got me wanting to give this a sniff! Mousse de saxe sounds like a marvelous scent to highlight in perfume. Thanks, Angela! I used to love those old J Peterman catalogs! What a genius way to market things. I’m glad you enjoyed the post. I bought myself a bottle of NdN for Christmas this year! I just moved into a beautiful new place and it was packed away in a box unsniffed…… Until just then. Your review came at a wonderful time for me as your words gave me a delightful and seasonal introduction to this one, it’s lovely. EDT . Maybe I’m just in the mood for Christmas but the initial opening smells to me like Christmas pudding. The alcohol and fruit/nut suggest this to me. I like that is quite neutral in aroma as I feel this will wear well with everything that goes on at Christmas ! Merry Christmas and thankyou for all your words this year. All your reviews this year have been read and enjoyed by myself. It really is a good, neutral one for the holidays! I hope you get lots of wear out of it in the next few weeks. And enjoy your new home! Loved your review! My mom wore Nuit de Noel, but I don’t remember how it smells. This has been on my wish list to revisit for ages. The bottle is one of the best. I do love a fragrant tree, but there’s something wonderful, too, about sparse branches so the ornaments really dangle in space. Around here, most of the trees seem to be Douglas or Noble fir, it seems. I never thought of wanting a sparse tree, but this does make sense! I love them with vertical distance between the branches! I read that too somewhere which is what has stopped me from seeking out a sample so far. To be fair, the small handful of Carons that I have tried have all turned out to be… unexciting which left me wondering if their overall (current?) style simply doesn’t suit me. I’ve heard it called boring–but as I wrote, I sure don’t find it boring! Oh, I’m with you – I’d never describe Austen’s books as boring! Not when they are so humorous and the language so beautiful. It might be that the old Carons just aren’t your thing. Have you tried Parfum Sacré? It’s a good one. Aimez-Moi is bright and cheerful, too. Oh, dear, yes, I tried both and they are the kind of scents I had in mind when I posted that – like an olfactory equivalent of a guy who seems wonderful on paper but with whom you have zero chemistry, y’know I happily recommend them to others but have no desire to wear them myself. This has been on my wish list forever. It’s even made it into my shopping cart but I just haven’t clicked on buy. One of these days I will. Great review as always, Angela. Maybe a sample will make its way to you and you can give it a try. I have been TRYING like MAD to source some Vintage Tabac Blond to smell because it sounds just so… SCANDALOUSLY Delicious! Haven’t had any luck…. Yet… This also sounds, To My Ears at least, just as Delightful! I have little experience with Caron Fragrances pretty much I have some Very VERY Vague Memories of Smelling Bellodgia and Nocturnes at Hudson’s in my Fragrance Infancy days… when everything that wasn’t Estee Lauder i was appalled By! LOL I remember the rosiness of Bellodgia… and the Richness of Nocturnes but nothing more… My mom has a Small Vintage Bottle of Fleurs De Rocaille and a large bottle of Aimez-Moi (Which is Decidedly LOVELY!) But that Fleurs De Rocaille… Now that’s something to contend with! I would love to get to know the Ouevre of Caron’s Old masterpieces a bit more… so i think in the new year… along with Sourcing Vintage Diors and Givenchys and of course ALWAYS BUT ALWAYS looking for that Rare Exotic Bird that is Chanel No.46 (Let This Be The YEAR, YE GODS!) I shall add some older Carons to the Search! Also on the hunt for some good old Ivoire De Balmain from the good old bad old days of the 80’s! Good luck! I hope you run into lots of Caron this coming year! I’d love to know what you think of them. Oh shoot, Angela. I was trying to avoid going downtown this holiday season, but maybe I need to go into the big Nordies and give this a sniff? I feel so much more comfortable in my little eastside bubble, but this sounds lovely, and I like thinking there may be a few oldies-but-goodies still worth a sniff! Do they have the Carons downtown? I can’t remember seeing them there, but that doesn’t mean anything. In any case, the Perfume House, handily located on the east side, definitely has them. Oh, perhaps you’re right? I would much prefer a pilgrimage to Our Lady! NdN is a classic choice for a Christmas perfume. What other perfumes make people think of the holidays? I can only think of Frasier Fir, but that’s a room spray. Wazamba is my Christmas perfume of choice! I alternate with Incense Pure. I really like to wear Nuit de Noel on Christmas Eve, and occasionally I’ll decide to wear it at other times when I just want something that smells good in a deep, quiet way. I wouldn’t call it boring, exactly, but rather ideal for the long, dark, contemplative nights around winter solstice. I don’t find VdN boring at all – it’s a favorite fall scent. I adore Tabac Blond but almost never feel like wearing it. I’d have to make some changes to measure up to the expectations it creates. Isn’t it funny how a person has to live up to some perfumes? As much as I love Carnal Flower, it’s only “me” about 0.5% of the time. I love your image of Tabac Blond girl at home in front of the fire in Nuit de Noel. I think her companion would be one of those grumpy cats only an owner can love. That’s funny about the grumpy cat! I can see that, too. That was the impression I got from Parfum Sacre – potpourri, it just strikes me as thirsty! Apparently the place, Burnt Norton, really did have a charming little rose garden! Yes, I’ve seen pictures. Looks lovely. Adding: I’m not much of a fan of PS either, tho’ I have tried to like it. Scratchy and sometimes sour. Scratchy and sour? It’s one of my favorites! (Although I admit I don’t wear it that often.) Oh well, I suppose that means there’s more out there for me. Angela, great review, as always! I’m curious about this fragrance, but wondering if it leans more feminine than I get from the list of notes. I have VdN EDT, and while I admire it, it definitely is too feminine for me to wear (I’m a guy), but I love the way it smells. If Vol de Nuit is too feminine, Nuit de Noel probably is, too. It’s worth smelling though, I think, just to get to know mousse de saxe. I remember I had a small sample of NdN for months and was unsure about it that is until I got ill. Because while I was recovering from my illness that late autumn in London 4 or 5 years ago the smell was always on my wrist. For some reason it worked so well with melancholical air and my state of mind as well as with a slightly heightened perception of all smells due to the illness that I bought a bottle of extract. And I have to say I was rather unfaithful to it during all these years. I always choose something more dramatic from my collection, but its rediscovery always brings me back to that point of time. I always wonder how different it is from the vintage one, but I would rather invest into vintage Tabac Blond (if I am lucky to get one) since this one is completely altered. Isn’t it amazing how powerfully a perfume can bring back time? I’m sorry, though, that it brings back a time when you were ill–although you certainly have a poet’s perspective on it. I wouldn’t mind some vintage Tabac Blond, either!